Parsnips and Pastries chooses one charity, non-profit, or community organization to donate to each quarter. The charities chosen range from nationwide to local, although we try to focus more on smaller organizations or those with the greatest need for help. Personally, charity and community have always been a big part of my life. I have volunteered for over 15 years with causes near and dear to my heart. Several causes I support and volunteer for include animals, children/youth, environmental, hunger, women’s rights, veteran/Military, and homelessness/housing. I would love to hear from you. Do you have a local organization or charity that you love and that we should feature? Contact me and let me know! We donate up to 10% of our profits to the featured charity and help in any other way we can, such as giving the charity/organization exposure through social media and our blog sidebar, and hosting bake sales, participating in events, or volunteering in person. This quarter’s featured charity is Spokane Humane Society. Besides donating to the charity for the quarter, I also volunteer in person and have done so for the past 8 months. 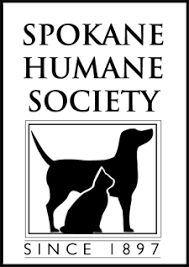 “The Spokane Humane Society was founded by a group of concerned citizens in 1897. Back then, we looked after the draft horses used to carry loads up Spokane’s South Hill. Today, we take care of more than 5,000 animals each year, mostly dogs and cats in need of compassionate care. Over the years, we’re becoming Spokane’s go-to pet adoption center. When we consider our more than one hundred years of history we are humbled to think of how much private funding we’ve received from those of you in the Spokane community who care deeply about the welfare of homeless pets. They thank you, and so do we. You can learn more about Spokane Humane Society here.